https://matcha-jp.com/en/5971 Okonomiyaki Tsuruhashi Fugetsu - Osaka Comfort Food With A Great View! Okonomiyaki Tsuruhashi Fugetsu - Osaka Comfort Food With A Great View! Osaka is known for its delicious okonomiyaki. 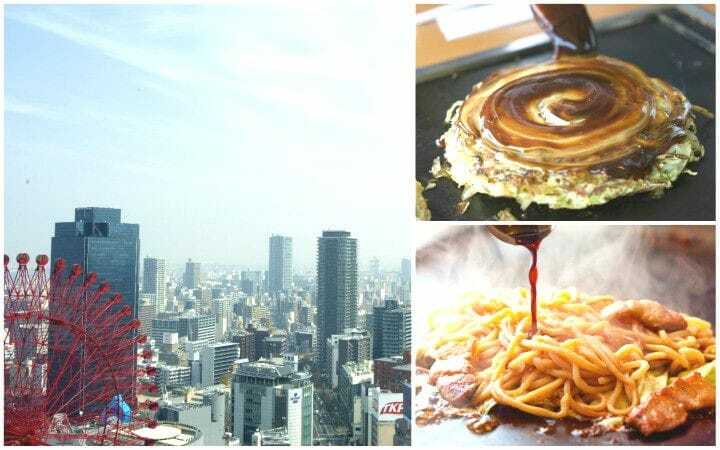 If you wish to enjoy some of the best Osaka okonomiyaki together with a great view of the city from above, we highly recommend Tsuruhashi Fugetsu Hankyu 32 ban-gai Store in Umeda Station. Osaka is well-known for its delicious comfort food. If you visit this vibrant city, the local food is a big part of the whole experience. However, deciding which restaurant to choose can be difficult. You probably also want to see as much as possible of the city and don't have much time to sit down too long for a meal. Let us introduce you to Tsuruhashi Fugetsu, an okonomiyaki restaurant located in the Hankyu 32 ban-gai building at Umeda Station. Here you can enjoy both tasty Osaka food and a great view over the city! Tsuruhashi Fugetsu has over 60 years of history to look back on. The first store opened in Tsuruhashi, which is a part of Osaka mainly known for its Korean town. They still honor their first store in their name even though their chain has grown to over 80 stores in and outside of Japan. They even have a franchise store in Santa Clara, California. They take big pride in the fact that they keep the same quality of okonomiyaki and taste throughout all of their stores, no matter where they are located. Their consistent quality is one of the reasons why they are so loved by their customers. Tsuruhashi Fugetsu Hankyu 32 Ban-gai Store - What Is So Special about It? While the quality of the okonomiyaki might be the same in all their stores, the Tsuruhashi Fugetsu store located in the Hankyu 32 ban-gai building offers one very unique point: it also serves as an observatory. Hankyu 32 ban-gai is a 31-floor high building known for its restaurants located on the top floors. Here you can enjoy a great view of Osaka while eating delicious food. Tsuruhashi Fugetsu, located on the 29th floor, is one of those restaurants offering a great view over Osaka. You can see the famous red Ferris wheel of HEP FIVE (a shopping building in Osaka) and a big part of the Osaka skyline. The view is especially stunning from the window seats. Okonomiyaki, Yakisoba or Tonpeiyaki - Delicious Treats To Choose From! After you get seated and enjoyed the beautiful view for a while, you get to decide what to order. Fugetsu's main menu consists in okonomiyaki (a savory pancake with cabbage and a variety of other ingredients) and yakisoba (fried noodles). They also offer tonpeiyaki, an omelet with green onions, pork and the same toppings as okonomiyaki, which is another very popular Osaka dish. They provide a multilingual, detailed menu which even shows how large are the portions, just in case you're not sure how much you should order. If you want to try a little bit of everything, they also offer set options to make the choice easier for you. If you come to Fugetsu for the first time, we highly recommend you try at least one of their okonomiyaki. If you look at the menu, you might realize that every okonomiyaki dish is available in two versions: as okonomiyaki and as modan-yaki. The "modan" in modan-yaki comes from the English word "modern". It indicates that this is a modern version of the traditional okonomiyaki. However, the only difference is that modan-yaki contains noodles while traditional okonomiyaki doesn't. Modan-yaki shouldn't be confused with Hiroshima-style okonomiyaki, although they both contain noodles. In Hiroshima, all the ingredients of the okonomiyaki are layered and compressed during the grilling process so that the okonomiyaki doesn't end up being too high. At Tsuruhashi Fugetsu, all the ingredients except the noodles and the toppings will be mixed and then fried on the hot plate altogether. The noodles in the modan-yaki are of the same type as in their yakisoba (fried noodles) dishes. Fugetsu's yakisoba noodles are known for being extra thick and firm. Some people even come to Fugetsu just for their yakisoba because it is known as one of the best yakisoba in Osaka. Fugetsu-yaki and Chee Tama Buta Okonomiyaki - Two Fugetsu Favorites! Fugetsu-yaki is, as the name suggests, the store's original okonomiyaki dish. It uses squid, shrimp, pork, and beef in one okonomiyaki. If you can't decide which okonomiyaki to take, this one in its modan-yaki version is a great choice. It gives you a little taste of the best that Tsuruhashi Fugetsu has to offer. The Chee Tama Buta Okonomiyaki is a newer invention but already a customer favorite. Chee stands for cheese, Tama for tamago (egg) and Buta means pork. This combination makes for a very rich, flavorful okonomiyaki. The cheese is mixed into the okonomiyaki batter with the other ingredients. The cheese will melt and spread throughout the whole okonomiyaki. You will be able to enjoy flavorful melty cheese with every bite. After you order, the staff will bring bowls with the ingredients to your table. It is a common practice in okonomiyaki and yakisoba restaurants for the customers to prepare part of the dish themselves. At Tsuruhashi Fugetsu, all the members of the staff are being trained for at least three months to prepare your dish to perfection right in front of you. The staff starts cooking the okonomiyaki by mixing up the ingredients. After that, it's time to arrange the mixture on the hot plate. Toppings such as the noodles for the modan-yaki and bonito flakes will be added at this point. Once the first side is golden brown and crispy, it is time to flip the okonomiyaki. After the okonomiyaki is fully cooked, it will be topped with a thick sweet sauce and mayonnaise. Fugetsu has their own sauce recipe and you can only taste this particular sauce at their restaurants or if you buy the bottled version to take home. The consistency of their okonomiyaki might also be a little different from what you are used to. They use less flour and a lot of cabbage in their recipe. The result is a delicious okonomiyaki that is crispy on the outside but has a soft texture on the inside. Okonomiyaki literally means "grilled as you like", so you are naturally welcome to eat it as you prefer it. However, we received some tips on how to get the most out of your okonomiyaki experience. Many people will cut their okonomiyaki into slices and take one slice at a time on their plate, just like you would do with pizza. This isn't wrong but the sauce is supposed to change its flavor while heated on the hot plate. If you take big slices off the hot plate, you miss out on the delicious array of flavors you could experience otherwise. The professional staff at Tsuruhashi Fugetsu taught us to cut the okonomiyaki into small squares and eat them directly from the plate piece by piece from the outside in. You can really experience the flavors change and you might not want to eat okonomiyaki any other way anymore after this experience. Enjoy the Osaka's Skyline With Delicious Local Okonomiyaki! You can enjoy Tsuruhashi Fugetsu's Osaka style dishes all over Japan and even at some places outside of Japan but the Hankyu 32 ban-gai Store provides you with a view like no other. Enjoying some typical Osaka food while watching the skyline you can truly feel the spirit of this city! Why not try it out on your next visit to Osaka? Fixed holidays Depending on the holiday schedule of the Hankyu Grand Building. Access 3-minute walk from Osaka Station. 5-minute walk from Umeda Station.